Business premises on the High Street, vacant as of October 2018. 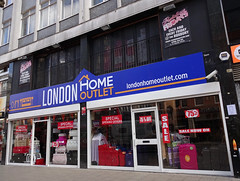 It was previously a homewares shop called London Home Outlet, but in late August or early September 2018 this moved down the road to Croydon Village Outlet due to redevelopment of the entire block photo of notice. Previously One 92 One bar (this was on the frontage as of July 2008, according to Google Street View, though it wasn't obviously still open). Until late 2012, the ground and first floors were occupied by Banana Joe's Bar photo and the basement by the Roxbury nightclub photo (according to planning application 13/01319/P, these two were connected internally). According to their website as of July 2012, the premises included a Caribbean restaurant which also did takeaway. The Roxbury was closed by police in November 2012, and in December 2012 its license was revoked permanently. As of December 2012 there was a notice on the door photo stating that the premises had been repossessed by bailiffs. As of August 2013 there was a notice up outside photo stating that a licence application had been made for sale of alcohol, live music, recorded music, dancing, DJ, and karaoke at this address under the name "Pals". However, nothing ever came of this. The premises remained vacant until early 2017, when a homewares shop called London Home Outlet opened some time between January and March. By August 2018 there was a sign outside photo stating that it was due to close down soon and the last day would be 28 August. By October 2018 the premises were vacant again, with a notice photo stating that London Home Outlet had moved down the road to Croydon Village Outlet. Last edited 2018-12-09 14:51:44 (version 33; diff). List all versions. Page last edited 2018-12-09 14:51:44 (version 33).